Thwarted by an electricity fault in a planned visit to Duck & Rice, my friend F suggested a trip to Antidote, the little wine bar off Carnaby Street which I was keen to revisit, as I did it all wrong last time, eating in the bar downstairs, with only cheese and charcuterie to keep me company. I’d dropped in on the off-chance, not knowing about the whole other world of food upstairs. And don’t get me wrong, the bar offering is of the highest quality and you do get to eat the bread, but I had really only scratched the food surface. We are fitted in at short notice and are led up some narrow stairs to the stark, minimalist interior, in that modish grey which I am trying to like but actually just makes me feel rather sad. Sparse lighting and bare floorboards complete the brutalist look. We are shown a table so small that I worry that there will not be enough room for plates and glasses and the bread, all at the same time. If you’re avoiding carbs, you will be denying yourself a thing of wonder, as the bread hails from Hedone, that Chiswick temple to ascetic plating and the cult of the ingredient, beloved of many a foodie. Heretical though it may be to say so, I believe the bread to be the best thing to come out of that restaurant. And the Hedone link is more than by bread alone; the owner/chef of Hedone, Mikael Jonsson is stated to be giving “guidance” to the kitchen. I wonder what that really means. This is a man for whom the whole business of running a restaurant seems to be a cause of anxiety and pain, his pursuit of perfection on a plate clearly an obsession. Also, he scares me a bit. F plumps for the set menu at £23 for three courses whilst I go off piste onto the à la carte. There is a £40, five-course tasting menu, but it seems de trop for a Thursday lunchtime. Before we start, a slightly odd white fennel granita, with chopped black olive, in a sort of buttermilk custard. I am not sure about it, but they bring the bread and all is forgiven as I bite into that crust and that chewy, holey-holy sourdough. F’s green asparagus, avocado, apple and verbena is a taste of spring, slim batons of crisp apple strewn over the asparagus with whorls of soft avocado mousse for spear-dipping, and the obligatory drift of something peppery on the side of the plate. 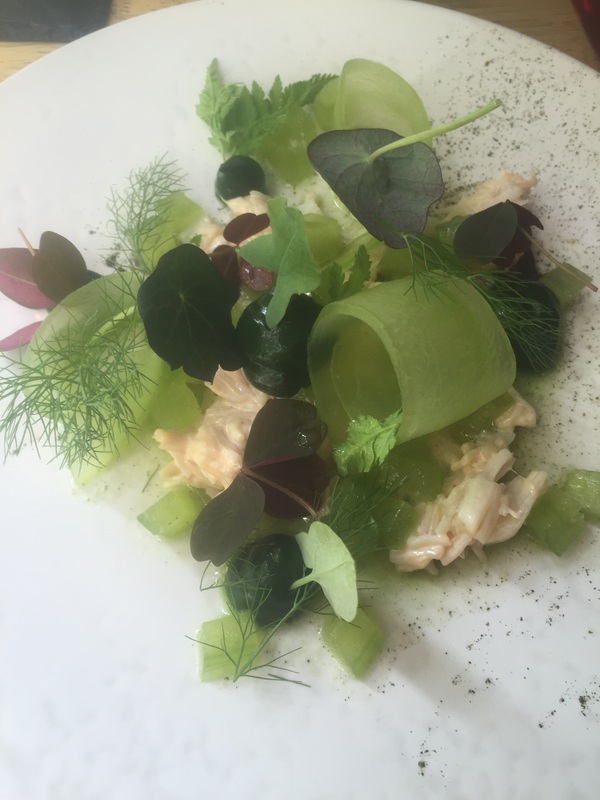 My Cornish crab and cucumber, with sprigs of fennel is a more elaborate, fussy affair, the cucumber lightly marinated and a rich green paste dotted between the crab, tasting vegetal and intense. The flavours are clean and sharp. There is, again some powdery substance sprinkled onto the side of the plate. Powder – it’s the new smear. 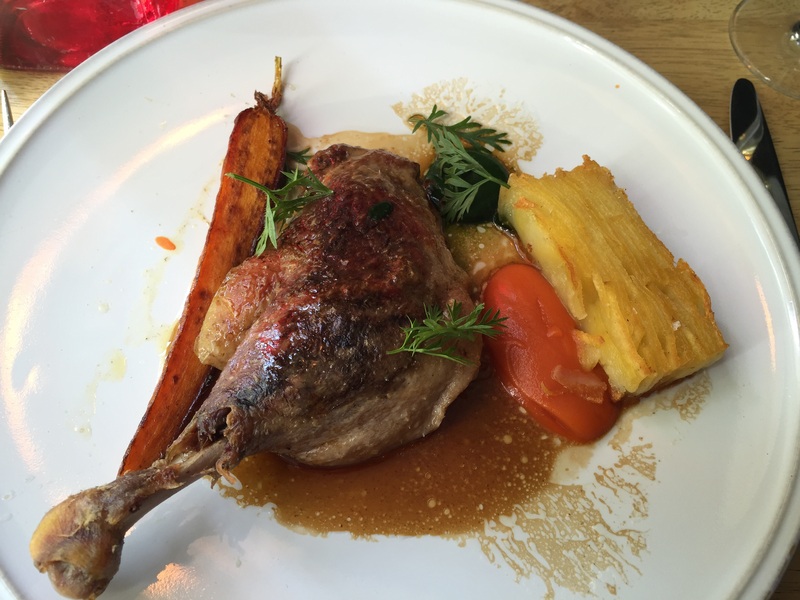 F has the confit duck, with roasted carrot and thin, crisp-yet-gooey layered potato, like a dauphinoise, but without any discernible cream. It’s a large leg in gravy, or should I call that jus, falling apart under the skin, under the knife. Comfort food.F is making appreciative noises from the other side of the table. My monkfish with spring cabbage, mussels and samphire is a knockout. 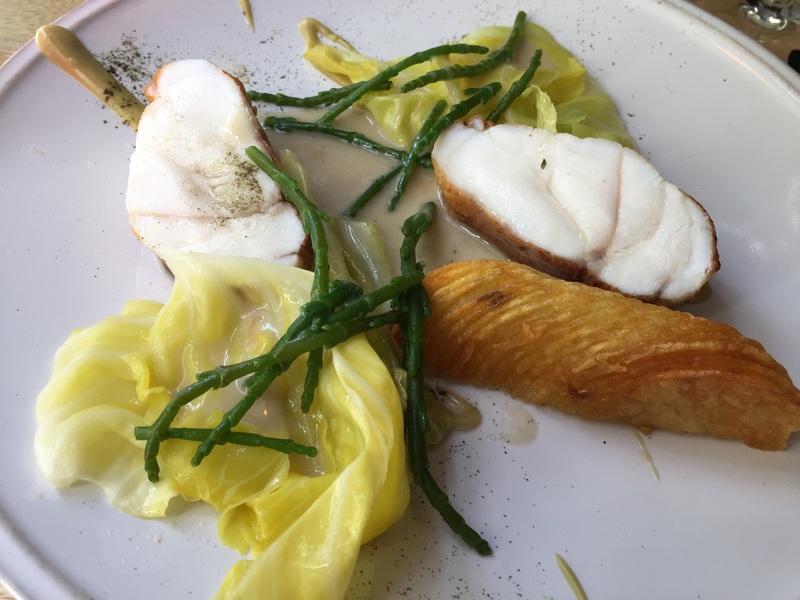 The fish is firm yet moist, not easy with monkfish, the cabbage simply steamed and the mussel cream sauce gentle and delicate, lifted by the saltiness of the samphire. There are some perfect hasselback potatoes, like serried ranks of hot thick crisps. What’s not to like? I am, I confess, emotionally unprepared for the marvellous simplicity and perfect execution of my lunch, to the extent that I allow myself more wine than entirely sensible, chosen by F. I start with a rosé, Chateau La Coste Bellugue. I think it tastes fine, but F tells me it has been in the fridge and lost its brightness. I still drink it, obviously. I follow with a Mas de Agrunelles, “Barbaste” VDP D’Oc, not something I would try left to my own devices, as it is a natural wine and thus off my radar. F has a “traffic light” system for natural wines and she places this is in the green/amber category. At £7, I am happy to be adventurous. More to the point the maître d’ knows his stuff and passes the F test, particularly when he doesn’t argue about the glass of red which needs to be replaced, being what we shall call the dregs. It is the only (small) duff note in proceedings. I would normally be happy to forgo dessert but after the main course I have an attack of FOMO and want to see what the kitchen will do for the finale. F chooses the caramelised banana, peanut and passion fruit sorbet and as soon as I see it I have dessert disappointment because I have ordered a Gariguette strawberry and lemon tartlet, a dessert without the crowd-pleasing caramel/banana combo, something sounding grown-up and sensible. 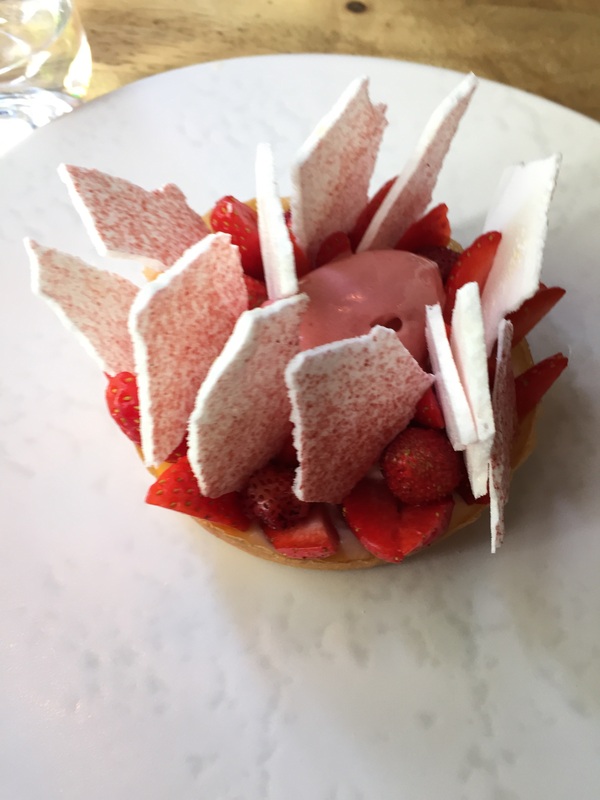 It doesn’t look sensible when it arrives though, all spiky meringue, like a pink hedgehog, sprinkled with pink powder and joy of joys, some added-extra fraises des bois, those tiny wild strawberries with the intense musky perfume, which taste nothing like your average supermarket offerings. Reluctantly I taste the ode to banana on the other side of the table. 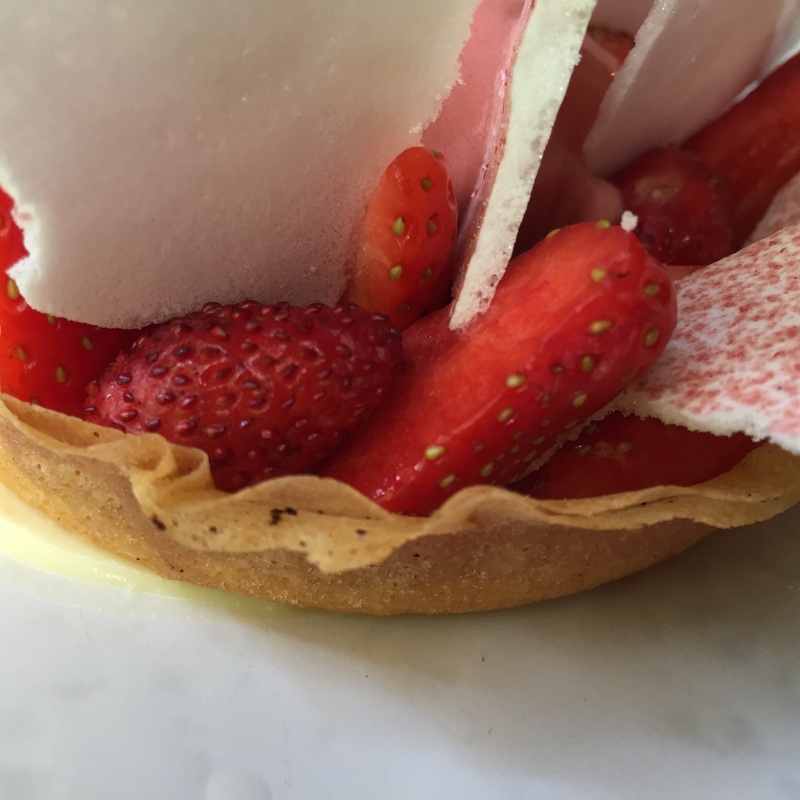 I do not know F well enough to cry, so I restrain myself and make do with the blameless strawberry confection. Not for the first time, F has won lunch with her set menu and it is clear that it is no poor relation but can stand up for itself. A little peek at the menu a few days later and I see that some dishes have been moved from à la carte to the set menu and the two menus are clearly interchangeable, making the set lunch a real bargain in an area not known for giveaways. Top food in tourist trap. Shocker. Tart with a heart of lemon. We’ve eaten the 4 course tasting menu here twice and both times it was excellent. Monkfish was on the menu the last time and, as for you, it was cooked to perfection. The wine flight was good too – I think they like to push the unusual. Spot-on review, Nicky. Thank you – it’s my new go-to for low-key client lunches in Soho.